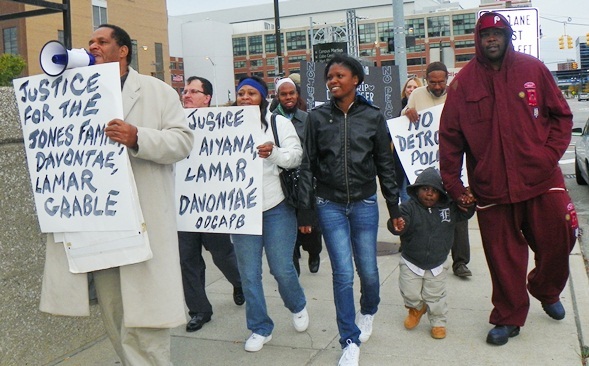 Protesters march outside Frank Murphy Hall in downtown Detroit Oct. 21, 2013. 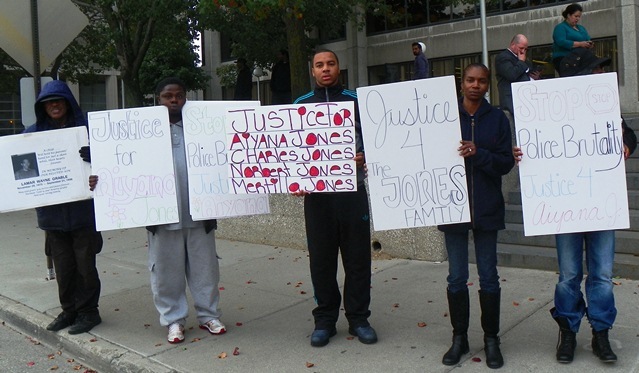 Families display signs outside courthouse (l to r) Gabrielle and Dominique Harrison, Oct. 22 protester, Khalid Fareed, Roberto Guzman, unnamed, Gary of Oct. 22nd, Herman Vallery, Cornell Squires, unnamed, daughter of Taminko-Sanford-Tilmon at her left, Jermaine Tilmon, with grandson Omari. Aiyana’s cousin Rafael Jones (center) got his high school in Warren to devote a whole page in its yearbook to her. 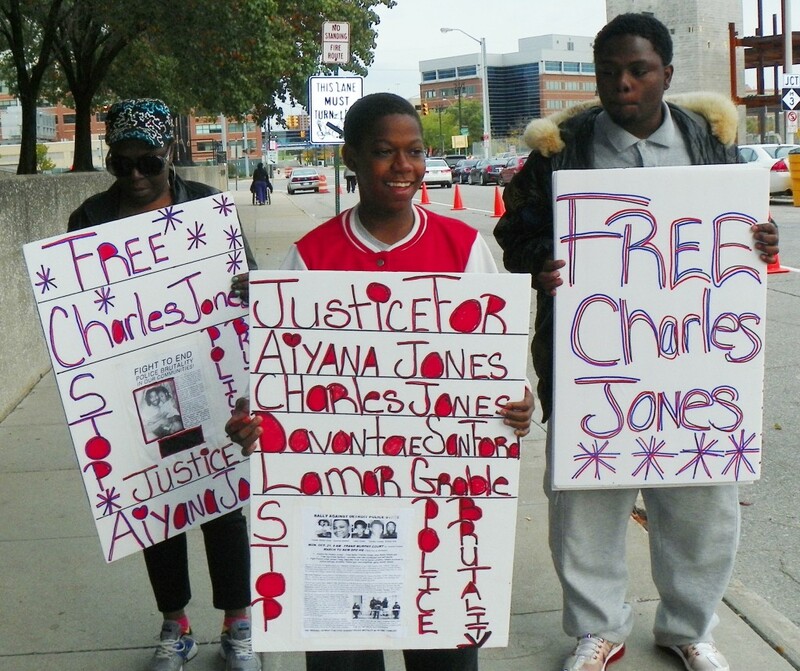 Over 50 people rallied outside the Frank Murphy Hall in downtown Detroit to call for freedom for Aiyana’s father Charles Jones, whose trial was set to begin that day, and to observe the October 22nd National Day of Protest Against Police Brutality. Jury selection in Jones’ trial was re-set for Tues. Oct 29, with that of Chauncey Owens re-scheduled for Mon. Oct. 28. 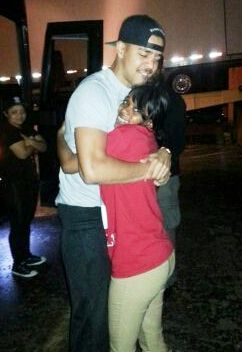 J. Cole shows his love and support for Dominika Jones, Aiyana’s mother, during Detroit concert Oct. 10, 2013. Aiyana Jones, 7, was shot to death by an MP-5 submachine gun wielded by Detroit police officer Joseph Weekley during a horrific military-style raid on her home May 16, 2010. Aiyana’s mother Dominika Stanley, grandmother Mertilla Jones, aunt Krystal Jones, and numerous other family members attended the rally to call for justice for Aiyana and freedom for Charles, who they say was framed up in the killing of Je’Rean Blake, 17, two days earlier. Questions remain as to Owens’ guilt in that case as well. Hundreds of young metro Detroiters attended a concert by J. Cole Oct. 10 at the Masonic Temple in Detroit. Cole has dedicated a video, “Crooked Smile,” to Aiyana and met with her mother and others during the concert. 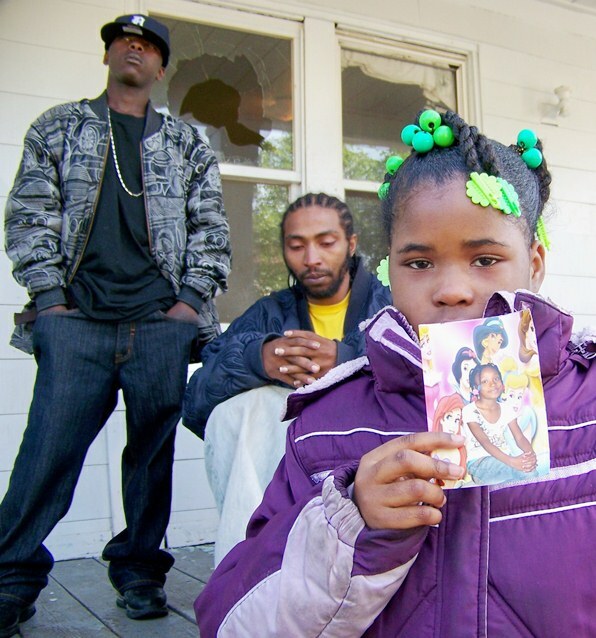 Mark Robinson (l) with Aiyana’s father Charles Jones, classmate Diamond Hardy, showing her photo, on morning of her death May 16, 2010. Mark lost his own grandmother, JoAnn Robinson, present during the raid as well, not long after due to her traumatized state. Aiyana’s cousin Mark Robinson, a key witness in the Weekley trial, which has been re-set to December 4 after a mistrial was declared earlier, was recently caught up in a series of what her family says are retaliatory frame-ups. He faces a court hearing Wed. Oct. 23 in 36th District Court. Robinson testified at Weekley’s trial that he warned the raid team there were children in the home after they threw him to the ground outside the house. Herman Vallery, father of Lamar Grable, killed by three-time killer cop Eugene Brown in 1996, and Lamar’s mother Arnetta Grable initiated the protest after learning that Brown’s partner during the killing, Vicki Yost, was just promoted to Deputy Chief by Chief Craig, selected by Detroit’s Emergency Manager Kevyn Orr with no input from Mayor Dave Bing. 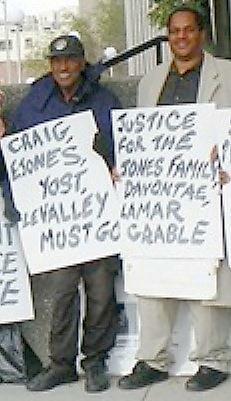 Herman Vallery, father of Lamar Grable, with Cornell Squires during protest. Lamar Grable’s family won a $4 million jury verdict against Brown after a lengthy civil trial during which renowned forensic pathologist Werner Spitz testified that Grable, 20, was literally “executed” by Brown. Yost was promoted several times after the killing. Multiple brutality lawsuits, including one filed by the Michigan ACLU, were later brought against her in other cases. “It seems like all the cops who are violating people’s rights are being promoted,” said Cornell Squires, whose son was framed by new-promoted Deputy Chief David LeValley and his partner at the time, notorious William “Robocop” Melendez. 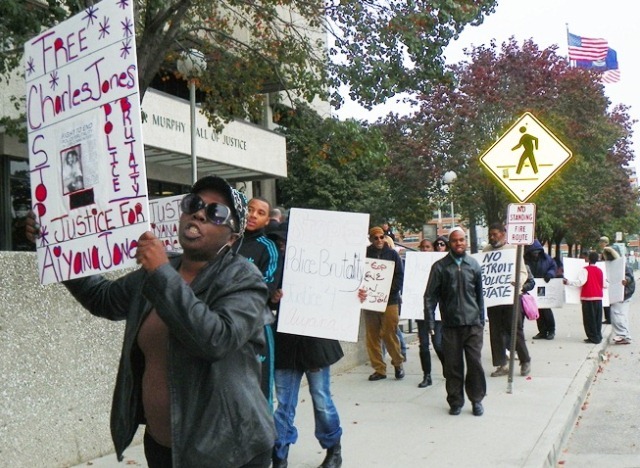 LeValley has been sued in federal court in multiple instances for brutality and misconduct. Melendez and 17 other southwest side cops were indicted by the U.S. Department of Justice in 2003 in an L.A. “Ramparts” style scandal involving brutality, frame-ups, perjury and other allegations. Chief Craig spent 28 years with the LAPD and served on the internal police review board that whitewashed the Ramparts cops, many of whom went to prison while their victims were released. The LAPD came out from under a USDOJ consent decree after 13 years in June. Craig lauded both the Los Angeles and Cincinnati Police Departments during his announcement of 43 promotions Oct. 8. Cincinnati cops also spent eight years under federal oversight after the police murders of 14 Black men. 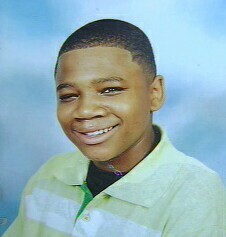 The murder of Timothy Thomas, 18, in 2001, sparked three days of rebellion in the Black community there. 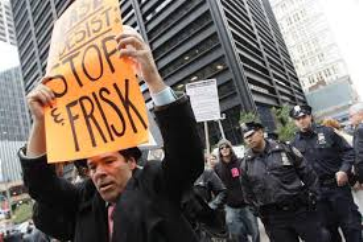 One of many NYC protests that led to judgment against Stop and Frisk. Roberto Guzman leads chants during march. The Rev. Richard Johnson El-Bey told VOD recently that he witnessed a crew of two white “skinhead” undercover cops stop a young Black man walking down the street in the Wyoming/Curtis area to make him show his ID and tell them where he was going. Shortly afterwards, Rev. Johnson El-Bey said, the same cops stopped a man who was unloading his truck in his own driveway, demanding his ID as well. 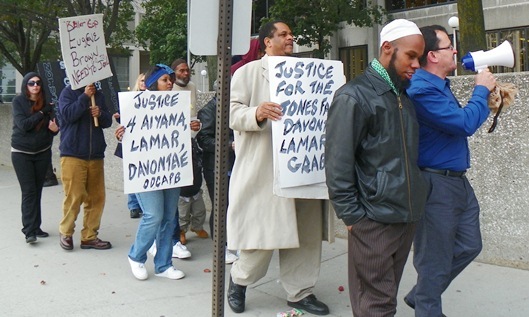 Roberto Guzman, a paralegal who has provided support to numerous prisoners and their families, led chants during the march and called for the resignation of Wayne County Prosecutor Kym Worthy over the case of Davontae Sanford, 14 when Detroit police elicited a false confession from him to four drug-house murders in 2007. Davontae Sanford’s mother, her daughter and grandson, and father are at right, as Cornell Squires leads chants. Admitted hitman Vincent Smothers later confessed to the killings, testifying Sanford had nothing to do with them. An appeals court ruled recently that Smothers and his attorney must be allowed to testify at a hearing to set aside Sanford’s guilty plea. The most recent report from Worthy’s office shows they have filed no appeal. 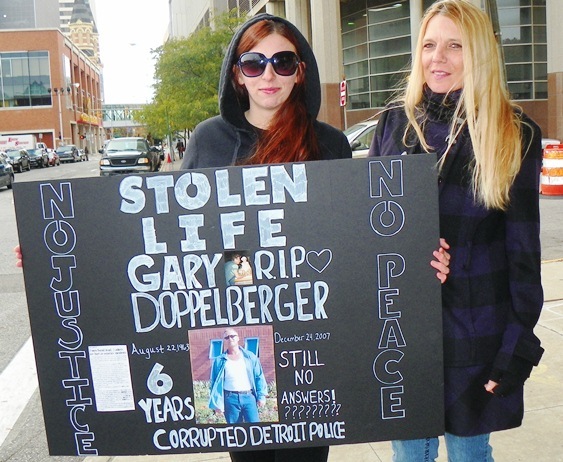 Gabrielle and Stacy Harrison attended rally to protest police inaction in case of their father and fiance Gary Doppelberger. The daughter and fiancé of Gary Doppelberger attended the rally as well. They say Detroit police have failed to do any real investigation of his death on Christmas Eve, six years ago. 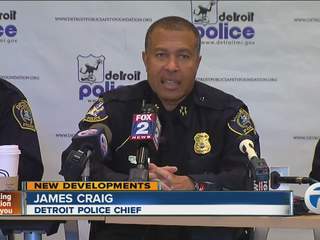 Detroit Police Chief Craig announces executive staff. In fact, Craig’s comments to VOD are reflected in the earlier article VOD did on his promotions, at http://voiceofdetroit.net/2013/10/18/httpvoiceofdetroit-net20131018chief-craig-intensifies-detroit-police-state-march-mon-june-21-9-am-as-trial-of-aiyana-jones-father-opens-in-frank-murphy-to-new-dpd-hq/. VOD did not request a sit-down interview from the department’s official spokesperson Kelly Miner, only specific responses regarding specific allegations about the officers. Arnetta Grable said the families involved in the protest discussed an invitation to meet with Craig made by Kelly Miner, but said they were reluctant to do so because their past experience has shown that complaints about police brutality only bring more of the same. 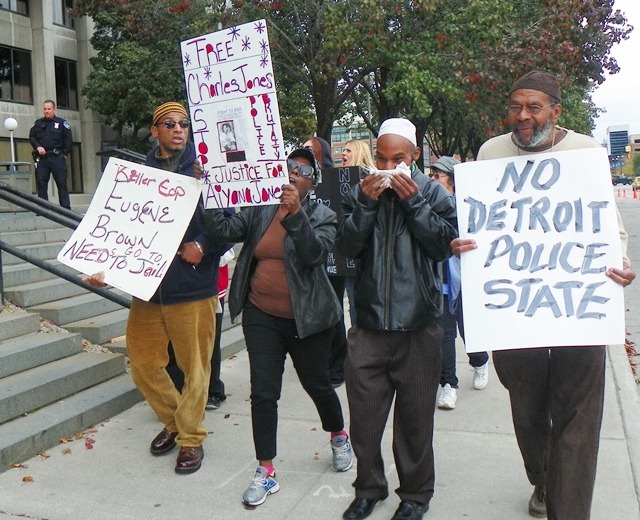 To contact the Original Detroit Coalition Against Police Brutality, which sponsored this protest, call 313-768-7202. 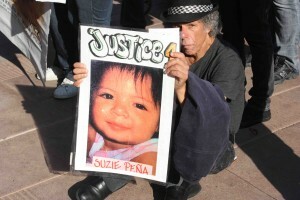 Aiyana’s grandmother Mertilla Jones leads marchers.